**CEDAR 3 PANEL GLASS SLIDING DOOR (2 Fixed and 1 Sliding) BARGAIN! Item: CEDAR 3 PANEL GLASS SLIDING DOOR (2 Fixed and 1 Sliding). EXTRA 20% OFF Auto-applied in Checkout - Limited Time! $200 per door, sold separately or as pair. 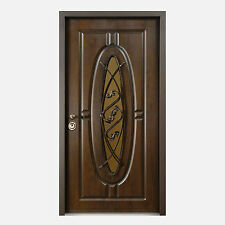 If you are after Security and Elegant looking entry door, this will be the DOOR you are looking for;. - Cold rolled steel door, coated with anti rust coating and timber looking paint. - Gas-bag magnetic seal. SOLID TIMBER WHITE PAINTED BARN DOOR. good condition. Quality security door made by Eurolux Blinds -still in operation in Tullamarine. Used for 2 months as an inside door of a garage. Quality steel grill frame with mesh, snib to lock without a key (not sure if I actually have the key) But barrels are not that dear to replace. No rust or wear shown. Pick up St Albans. Dimensions 820 wide 204 height 220 diagonal See photos. 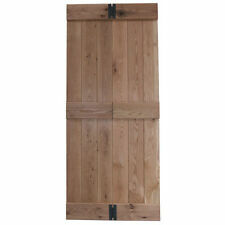 5 Wardrobe solid Core timber doors With Hinges and Handles One door with mirror. White inside ,Cream outside with rounded edge profile. aluminium glass sliding doors. Condition is Used. 3 year old B&W branded windows white sliding doors with Performance glass. (100mm section) Slider 1 4620x2080 high Fixed /slider/slider /fixed Slider 2 2640x2080high Fixed /slider (Damage to the flyscreen mesh only on this one) Timber reveals Buyer to remove from demolishing house site. $1600 for both Or happy to separate. Offers excepted ! Entrance door with side panels plenty of keys needs a clean up door 2040x820 panels 390x350. Cash pickup from Mornington Vic 3931. Original mid-century interior doors. Lead light design of Lillies in white and green and clear. In excellent condition. Available as one or a pair. Price is for one door. Stain glass doors. Glass= 1720 x 580. Solid Wood Internal Doors With Glass Inserts. Painted natural white. 2000mm high 35mm thick One door is 805mm wide and the other is 820mm wide Comes with all hardware as shown. Local pickup only from Elsternwick VIC. Corinthian Entrace Door. Madison external. 2340 x 1020 x 40 New, but been in storage. Has some surface scratches that paint will fix. Pick up and cash on pick up or pay extra for my PayPal fees. Corinthian infinity front entry door. 2340x920 New condition, coming off a brand new home. Door is free of damage These doors are worth over 800 dollars.....practically giving it away. Doors will need a sand and a paint. French Doors with Two Panes of Clear Glass & Pet Door. 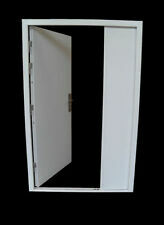 These doors have a pet perspex pet flap – 305 mm wide x 450 mm high. The Glass is single glaze laminate glass. THIS CLOSER CAN BE EASILY INSTALLED TO YOUR EXISTING SCREEN. CLOSER CAN BE EASILY DISCONNECTED. Fly screen doors, Aluminum screen doors. 2 WHAT DOOR /SCREEN IS MADE OF. to suit your individual need. White Aluminium Bifold Door Unit. From inside the 1 x door is on the right and the 2 bifold panels slide to the left. Code – Kitchen / Patio. This is a building site so appropriate footwear must be worn and no children or pets will be allowed on site. The size is 82cmx204cm =5 pcs. Also include the hinges as displayed in pictures. 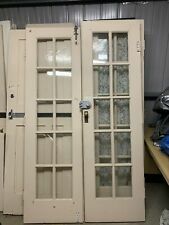 Solid Timber / Wood French Double Doors 10 Pane Bevilled Glass - Possibly Teak? Pair of Solid Timber French Doors with 10 Panes of Bevilled Glass. There is a sticker that says doors are made in Indonesia - We believe they are Teak - Very solid, very heavy doors. Width: 820mm. Hard to find extra large wider imperial size door. Good condition. No compromised joints. From new house so no weatherbeaten problems. Four glass panels with horizontal reeded / ribbed /ripple glass. This 2m sliding barn door hardware kit suitable for door width up to 1000mm. To install this system, the wall must be strong enough. Floor Guide 1. For Door Weight Up to 120kg. 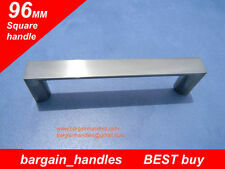 For Door Thickness 35-45mm. Security Screen Door - 2315 x 995mm, steel, maroon/burgundy colour. Security Screen Door - 2315 x 995mm, steel, maroon/burgundy colour. 3 x hinges. Keyed lock. Condition is Used. Local pickup only. 2040x 820x40 - maple timber joinery French door with 10 clear glass panels, external grade, use internal or external. Condition is Used. Its all there but the seals and rubbers would need replacing as does one panel of glass that broke in transport. Condition is Used. The locks work and key is available. PACK OF 2 x DOOR WEATHER STRIPS, DOOR SEAL. FIT IN 1 MINUTE. NEAR INVISIBLE. If you're planning on renovating your home and opening up your living spaces with light, there is perhaps no better way of doing so than with a set of French doors. If you have a deck, balcony or patio, a set of French doors opening outwards can make your indoor space seem larger, while letting in a lot of beautiful natural light. Internal French doors between rooms can also work to open up the space, and are particularly well-suited to houses with wooden floorboards, allowing the continuation of the flooring from one room to another. There is a fantastic range of French doors available to buy online on eBay, so no matter what style you're looking for, you're sure to find something to suit you. Looking for vintage or antique French doors? You're in the right place! There is a vast array of pre-owned and antique doors available on eBay, allowing you to save money in some cases, while finding the perfect set of doors for you. When comparing the options, you may want to narrow your search according to frame material if you have something specific in mind in terms of aesthetic. However, when purchasing a set of French doors online, the most important thing to do is double-check their dimensions to ensure that they are suitable for your home. If French doors aren't quite what you're looking for, explore the extensive range of doors on eBay to narrow your search according to brand, material and type of door. If you're looking for doors or door parts, check out the range of doors and door hardware available, both new and second hand. Shop online on eBay today and find the perfect door to put the finishing touch on a home you'll love to spend time in!